XL electrical cord, electrical cable 3x0,75. Rough jute fabric covering. Diameter 16mm. The electrical cable becomes electrical cord. The double covered electrical cables are covered with soft flocked and raw jute in order to reach a 16 mm diameter. You can use XL electrical cord covered in raw jute to match our new natural wood roses and lamp holders in order to create suspension lamps of great effect. The cable is sold by the meter, multiple orders will be delivered in one piece up to a maximum of 20 meters of length. Visible Spiral Flexible Cable with DOUBLE ISOLATION(transparent supplementary sheath), under textile braid. Standard delivery time will be between 7 -20 days from the moment the full payment has been received. Some products on the website have the option that the product can be pre-assembled in Italy, if you choose this option then you will have to add 10 days more to the standard delivery time. We will ship all orders internationally with TNT, or Fedex. And locally in middle east with Wings. All taxes, duties and customs fees are the responsibility of the purchaser. XL electrical cord, electrical cable 3x0,75. Natural linen fabric covering. Diameter 16mm. XL electrical cord, electrical cable 3x0,75. Raw cotton fabric covering. Diameter 16mm. 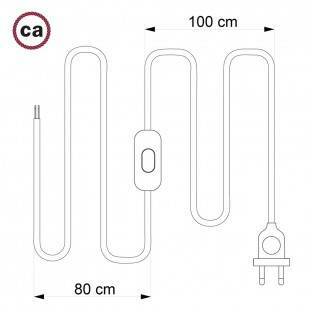 XL electrical cord, electrical cable 3x0,75. Natural linen and raw cotton fabric covering. Diameter 16mm. XL electrical cord, electrical cable 3x0,75. Natural linen, cotton fabric and jute covering Country. Diameter 16mm. XL electrical cord, electrical cable 3x0,75. Bright fabric covering Bernadotte. Diameter 16mm. XL electrical cord, electrical cable 3x0,75. Bright fabric covering Orleans. Diameter 16mm. 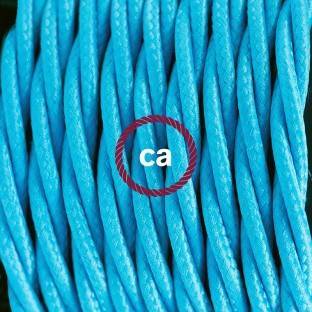 XL electrical cord, electrical cable 3x0,75. Shiny black fabric covering. Diameter 16mm. XL electrical cord, electrical cable 3x0,75. Shiny dark green fabric covering. Diameter 16mm. XL electrical cord, electrical cable 3x0,75. Shiny dark bordeaux fabric covering. Diameter 16mm. 2XL electrical cord, electrical cable 3x0,75. Rough jute fabric covering. Diameter 24mm. 2XL electrical cord, electrical cable 3x0,75. Natural linen fabric covering. Diameter 24mm. 2XL electrical cord, electrical cable 3x0,75. Raw cotton fabric covering. Diameter 24mm. 2XL electrical cord, electrical cable 3x0,75. Natural linen and raw cotton fabric covering. Diameter 24mm. 2XL electrical cord, electrical cable 3x0,75. Natural linen, cotton fabric and jute covering Country. Diameter 24mm. 2XL electrical cord, electrical cable 3x0,75. Bright fabric covering Bernadotte. Diameter 24mm. 2XL electrical cord, electrical cable 3x0,75. Bright fabric covering Orleans. Diameter 24mm. 2XL electrical cord, electrical cable 3x0,75. Shiny black fabric covering. Diameter 24mm. 2XL electrical cord, electrical cable 3x0,75. Shiny dark green fabric covering. Diameter 24mm. 2XL electrical cord, electrical cable 3x0,75. Shiny dark bordeaux fabric covering. Diameter 24mm. 3XL electrical cord, electrical cable 3x0,75. Rough jute fabric covering. Diameter 30mm. 3XL electrical cord, electrical cable 3x0,75. Natural linen fabric covering. Diameter 30mm. 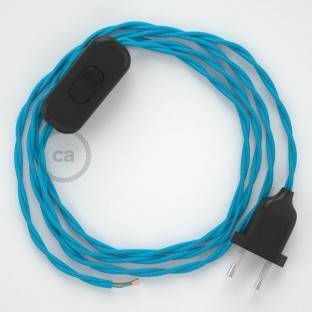 3XL electrical cord, electrical cable 3x0,75. Raw cotton fabric covering. Diameter 30mm. 3XL electrical cord, electrical cable 3x0,75. Natural linen and raw cotton fabric covering. Diameter 30mm. 3XL electrical cord, electrical cable 3x0,75. Shiny black fabric covering. Diameter 30mm. 3XL electrical cord, electrical cable 3x0,75. Shiny dark green fabric covering. Diameter 30mm. 3XL electrical cord, electrical cable 3x0,75. Shiny dark bordeaux fabric covering. Diameter 30mm.